A prominent belief in Jewish tradition is that the coming Messiah will “rebuild the temple.” Jesus too said he would “rebuild the temple.” But what temple? A prominent belief in Jewish tradition is that the coming Messiah will “rebuild the temple,” also known as the Third Temple. Jesus too said he would “rebuild the temple.” But what temple? It seems to me that Jesus taught in his ministry that the true temple was not the physical building in Jerusalem “made with hands,” which he said he would “destroy” (Mark 14:58; this opposition being what may have got him killed). Rather it was the temple of one’s own mind and body, the human temple, the human community, human beings, the realization of God that lives within each and every human heart in relationship to one another. That is the true “temple” that Jesus said he would “rebuild,” and did rebuild, and that Paul taught over and over and over again (1 Cor. 3:16-17, 6:19; 2 Cor. 6:16). Rome Italy Temple of the LDS Church. But even Christians today sometimes fail to recognize Jesus and Paul’s teaching. 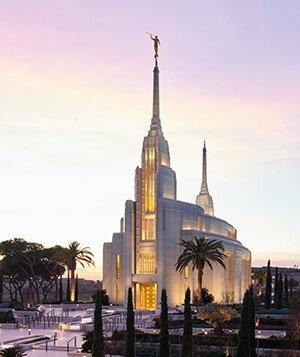 My former LDS tradition is presently building temples all over the world, 162 dedicated as of today, including one recently completed in Rome. And there is a tradition that Mormons will build a temple in Missouri, the “New Jerusalem,” to mirror the one in Jerusalem, in preparation for the Second Coming of Christ. It is believed that Christ (as Jesus) will come “to his temple,” many thinking it is one of these buildings made of precious stones, fine woods, and skilled human-made mortar. How soon we forget that the true temple is not any of these physical structures or buildings. None of them. God dwells within people, in real living breathing human beings, in Life itself, in Love, and is the foundation or Source of all life and consciousness. That is the holy temple. You are the House of the Lord. It is not outside of you, but is you. I perceive that the “Second Coming of Christ” or the Messiah “to his temple” is the direct realization of God in one’s Self, in the true “temple” of one’s very own mind-body, and therefore in all beings everywhere. When we recognize this for ourself, when we awaken to it, then we will be rebuilding the true temple of humanity, of Love, of God living in us, of Christ in us, valuing and loving each and every person that lives on this planet as the holy temple of God, as divine beings, and even every other living thing as well. God has never been external to us, separate from us in a distant heaven, but is our own deepest Self. That is the mystical “secret” that no one knows until they experience it for themself, in themself. The Life in us is God in us, and I know from personal experience that we can come to see and know this for ourself (Gal. 2:20). We can see it in deep states of meditation and contemplative prayer, in near-death experiences, sudden conversion experiences, mystical experiences, true initiatory rites of passage, experiences which radically alter consciousness, experiences of deep suffering, crisis, or tragedy which dissolve the ego-self in our mind and reveal the true Self to us. It seems that the “repentance” or metanoia that Jesus preached was a transformative “change of mind.” We have to change our mind, alter our consciousness, go beyond the everyday ego-mind, in order to become fully aware or conscious of God living in us. If we don’t do this, we will continue to be focused on external temples made with human hands, external performance-based religion, dualistic conceptions of God in a distant heaven, and we will be alienated from our own true divine Self, even our humanity in us and around us. We can come to realize that we are Christ coming to the temple in our very own mind-body, in every moment of every day. God is the very foundation of our own consciousness, the energy which flows through our own mind and brain, the Light of awareness in your mind even right now as you read this, the very Source of the Life within us, and is that Life within us. We are One in God, even right now, even if we don’t know it. That is the infinite Grace of God. There is no other Christ/Messiah out there than our own Anointed Divine Self, which includes all beings, everywhere. If we want to truly know Christ, we will find Christ nowhere else than within, and this will simultaneously reveal Christ in every other being everywhere.